the bench has been very quiet for the past 2 days, following the completion of the Gripen. there has been more modelling activity this week, even only minor parts building and research. research work for my next project, the KC-787 Next-Gen Refueling Tanker has been completed. additional parts for this project (Refueling boom and 2 HDU pods) have been scratchbuild. building will start as soon as i can clear some space on the shelves. last night, i also printed out a small decal sheet for the next projects (usually make a new sheet (10 x 15cm size) every 2 or 3 months, depending on the planned projects and required sizes). but thats for future-Nils to worry about. before starting on the KC787 tomorrow, im gonna check if the temperature in the workshed is warm enough to spray the decals (and warm enough for the coating(s) to dry). this week, i have started on the first part of what i can now call the "World War 3: rise of the dragons" alternate history story / build theme. this replaces my earlier 1/144 build topic and will concentrate on a near future conflict where China rises to a world superpower level, and a world where the Soviet Union never collapsed, but more on that in the original upcoming thread. this will be a very ambitious buildtheme/storyline, spreading over Asia, Europe, the Middle east and the American continents. most of the builds will exist out of upgraded current generation aircraft, future 5th generation aircraft and helicopters and scratchbuild prototype fighters, transport aircraft and drones. i might even ad some ships/subs into the mix. meanwhile, i gotten to take a look at the current line of builds and i really need to get those done at some point (being 3 1/72 seakings nearly completed, a 1/72 dutch F-4E Phantom, 1/72 spitfire racer and a 1/144 L188 Electra and F-117N) i also have to get going on refurbishing some older builds. on a personal note, on monday i am starting on what might be my last week at work, with the workshop closing down after the new owners took it over last october and decided to move all activity to a new facility out of range from where i live, making it impossible to get there. so i have started looking out for a new job a few weeks ago, but with the crisis in the metal sector, it looks like i might be home for a while, i might even be concidering changing my line of work and re-educate to another profession, as the metalworkers market is flooded with low-wage Eastern-European workers (no offence, but almost every company in Belgium prefers to work with immigrants over indigenous people, witch i think is kinda discriminating. ), and it kinda kills the branch. i could go on and on about this, but i do not wish to offend any of our Eastern European members on the board. modelling has been quite quiet for the past week, but in the next days/weeks/months (hopefully not years) there will be almost daily activity. Not knowing when/what my next job will be, i will have to keep myself from sinking into depression again, so i will be going into styrene Therapy for the time being. beginning with FINALLY finishing those commision builds (2 Seakings) i have going on, witch have been delayed for some time, and i have another one in the pipeline aswell (another seaking, appears there's a huge demand for Belgian Seakings at the moment). when the first 2 commision builds are done, im gonna start work on 2 new builds, Realworld Belgian NH90TTH & NFH's. but before that, i have to (again) finish what i got on the bench at the moment, in order to free up space. all that would take at least a week or 2 (or more). furthermore, later this week im gonna go shopping for more storage cabinets and DIY shelves, replacing some older, space eating ones. this to at least solve part of my storage problem (realising now that im kind of a hoarder, HELP ). meanwhile, im also gonna reorganise some paperwork and, most importantly, my workbench. the workbench is finally clearing up, i got 2 realworld projects finished, a 1/144 Belgian F-16AM and a 1/72 Seaking. the latter is one of the 3 (previously 2) commisioned builds, it has been picked up here this morning and is now on display in an office at the Saint Jan's hospital in Brugges (where the real thing regulary lands). meanwhile, im also designing a new indigenous stealth fighter (currently known as YF-X) for my WW3 themed build, im using a trumpeter 1/144 YF-22 as a basekit. All 3 designs look good Nils. My personal favourite is the bottom one - looks like an updated Viggen ? Concur!! Next Swedish aircraft after Draken and Viggen........possibly the Kraken? little to no change compared to last week, except for fprgress in a long standing project. ive been taking another look at the minicraft 1/144 L-188 Electra, and figured i have no idea what to do with it. i finally decided to cut her up and convert it into a P-3 Orion derivative. conversionwork that has happened at the moment include a nosejob (737 nose and plenty of PSR), shortening the forward fuselage (15mm plug cut out) and adding a stinger to the tail. browsing through the sparesbox, i found an old 1/144 radome from a scrapped revell E-2 Hawkeye, and im currently building an AEW version of the orion, similar to that used by the US dept. of Homeland Security (ex US Customs). 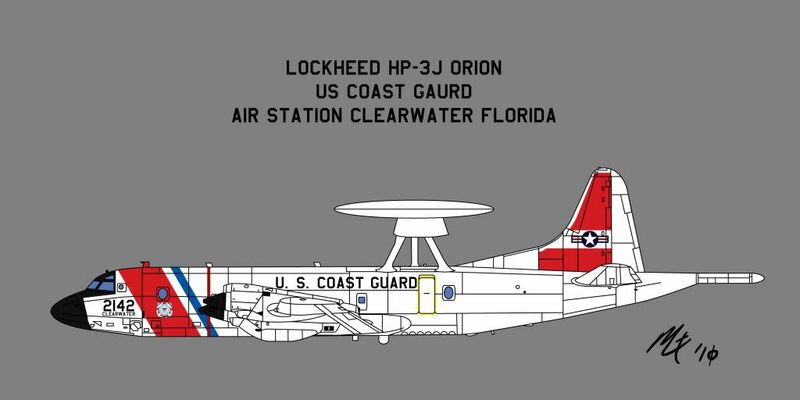 i dont know what marking im gonna use yet, might go US Coast Guard or a Danish Air Force version, but im seriously thinking of going USCG on this bird , similar to this profile of Cliffy B that i found here. last sundays visit to the Bronco Fan Day (see Plane Spotting thread) really sparked up my motivational engine, and im concidering building 1 or 2 1/72 OV-10 Bronco's. i already have an academy OV-10D in the stash, thinking of building a Genovian Air Force version of that aircraft, might even buy another OV-10A, and build it as a RW Luftwaffe machine (as the 99+18, seen last sunday). i always though the bronco was kind of a small light aircraft, but now that i had a chance to get up close and personal with it, ive seen that that thing is huge . my workbench is clearing up. i just finished building the last of the first batch of commision built seakings, and the last one on the table (one for my peronal collection, painted up in the colors of the one i flew in 2 years ago) is also nearing completion. next on the table will be 2 newly become RW NH90TTH en -NFH's in Belgian Markings, the first Belgian NFH is expected to make its official first flight tomorrow, with delivery by the summer, im gonna see them fly over here very often then. also im preparing to start on a new WHIFF, a USAAF Northrop N-9MA (modified to an in-service fighter version, the P-45 Stingray). i also have a little announcement regarding my "WW3: Rise of the dragons" story build. Due to recent events and tentions in the DPRK, i am currently postponing any posts on that project. when things calm down, i will be making new posts/models in that thread. after putting the "WW3: Rise of the dragon" in Hiatus due to rising DPRK tentions, i decided to look further on this story themed buid. over the last few days, i started looking at some youtube videofootage of the former DDR, particulary its armed forces. i had already forseen that in the storyline, the Soviet Union would not have collapsed, and that by then, East-Germany still existed. but looking at the last ORBAT of the DDR-NVA dating back 1990, i thought about replacing the by then obsolete MIG-23's en MIG-21 by new air defence fighters, im thinking either 4.5 Genereation fighters like the Su-37 Terminator or the 5th Generation Su-47 Berkut. as for an SU-22 replacement, im still working it out, i might go for UCAV's (even though i dislike unmanned combat drones). im currently making a list of what countries should have what equipment, then i would buid these in 1/144 or 1/72. at this moment im just looking into the air assets, but ive recently put together one of those anti-meteor misilles from an 1/72 Airfix TSR.2 (Stratos 4 version) and i think with a good paintjob and decals it would make good nuclear cruise missile, still need to look into making a launcer for it. could also aquire a Academy 1/100 space shuttle and use the booster rockets/fuel tank for a set of Western/eastern missiles. im also concidering buying 2 more 1/144 Gepard-class schnellboats and maybe sovietise one of them into a Soviet Navy fast patrol boat. might even ad some older but still modern equipment for African and South/Central American countries. so by the time the storybuild gets going again, i will have lots to build/share. my WW3 storybuild may still be on hiatus due to Kim Jong Un's sabre rattling, but behind the scene, im still working on some of the models for the storyline. the table is now being cleared to start work on the next model in the timeline, a DPRK Su-47 Firkin-A, witch will be painted in a similar scheme as the DPRK's MIG-29's. also on schedule, is a undisclosed secret project in the story, witch will be revealed when the time is right. spring is in the air, time for some cleaning. thought i would sort out the 1/72 stash, make room for more by placing some less urgent builds on the attic. filled a box with about 20+ kits to go into long-term storage. later this week i'll be clearing the shelves, placing some older built models on the attic, make room for the newer and better ones. its been about a month and a half since i got laid off, and the job search has not been easy. i havent had many calls or interviews (only 2 in the past month) mostly because due to the financial crisis in Europe, finding work has never been harder. and i i did found something, the pay they are offering is way below my standards. ive been thinking about changing to another line of work, but i dont see any jobsectors with a shortage at the moment. companies in Belgium tend to hire low-cost Eastern european workers or are moving to Eastern Europe (the Czech Republic and Poland are popular atm.). i dont want to go into it further, or im just gonna start ranting and end up being depressed again. And, if thing here werent bad enough already, my LHS, witch is only 5 minites away by bike, has now been closed. the owner said the landlord has given him an eviction notice since he wants to level the place to build 2 appartment buildings. anyways, sorting through the stash, ive gathered all my '46 related kits to see what to build next. there is a '46 groupbuild starting on another forum next week, thought i might use the opportunity to build a few more kits for my "WW2 beyond '45" storybuild. after all the German kits, a few Allied/Neutral vehicles might look nice ammong the collection. the bench has just been cleared this week, and a number of new project are currently occupying it already. the first 2 are a pair of Belgian RW NH90's (TTH and NFH variants), with the interious of the TTH now almost finished. also on the holdline, are the first 2 1/72 models for the WW3 storybuild, the first helicopters, an EC635 and an EC665 Tiger-AHB (AHB = Attack Helicopter Belgium). although i might take another 1/72 kit in between. also, preliminary work has begun on a Belgian Spitfire F.Mk.22, for the beyond '46 GB over on BTS. the kit will be the excelent Airfix Spitfire F.22 combined with DACO's new Belgian Spitfire decal set. reason is that practicly everything is available in 1/72, although it does sacrifice shelf space, something i have a shortage of. i will still include the occasional 1/144 fighters or helicopters. also, a couple of days ago, i was strongly concidering taking up another hobby, namely vlogging. i was going to make it an aviation news themed vlog, but now im starting to concider making it a scale modelling vlog, with DIY instructional video's for the budget minded modeller and kit reviews. the name i came up with was "Runway 29" (read Two-Niner). although like most of my plans, i think that might end up in the "project cancelled" bin.